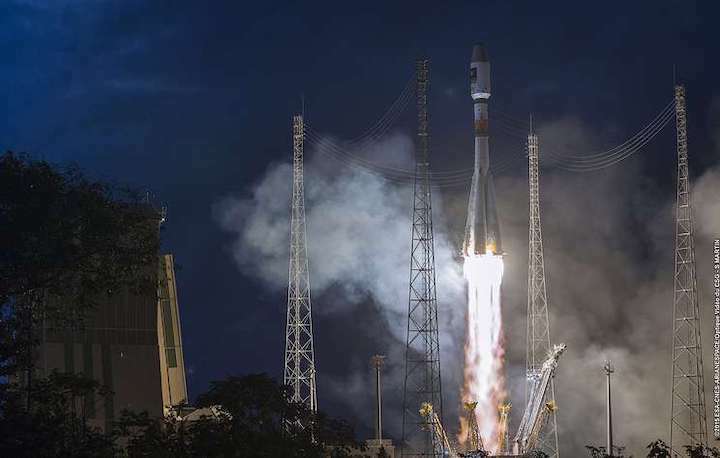 Arianespace has completed a major preparation milestone for its next Soyuz launch with integration of the mission’s high-profile payload: the initial six spacecraft in OneWeb’s constellation, which will provide affordable high-speed internet access for users around the world. 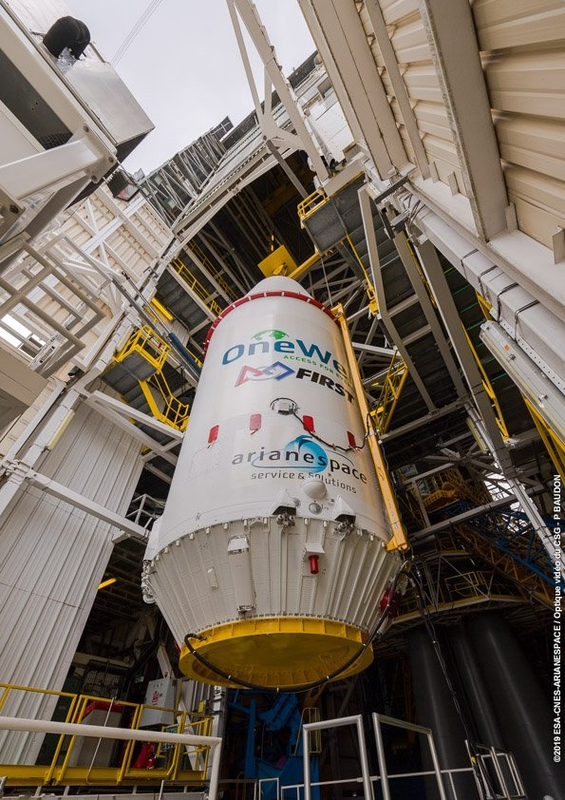 The spacecraft – produced by the OneWeb Satellites joint venture of OneWeb and Airbus – will be orbited on Arianespace’s first Soyuz mission of 2019 from the Spaceport in French Guiana. 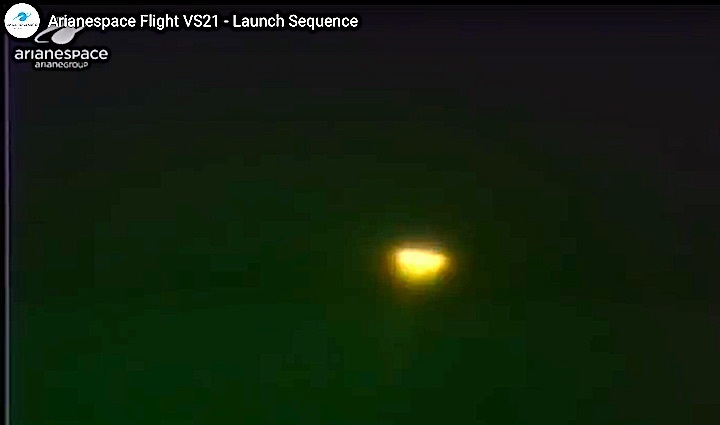 Designated Flight VS21, it has a targeted liftoff of February 26. Integration of the six satellites on their multi-payload dispenser system – which will deploy them during the mission from atop Soyuz’ Fregat upper stage – was completed in the Spaceport’s S3B payload preparation facility. Once placed in a near-polar orbit by Soyuz, the OneWeb spacecraft will operate at an altitude of 1,200 km., giving customers extremely low latency and providing communications access to the entire world with fiber-quality internet connectivity. OneWeb is building the world’s largest and highest throughput satellite system to connect everyone, everywhere – by land, air, sea with a vision to bridge the digital divide once and for all. To develop its constellation of 150-kg. satellites, OneWeb signed a contract with Arianespace in 2015 for 21 Soyuz launches. 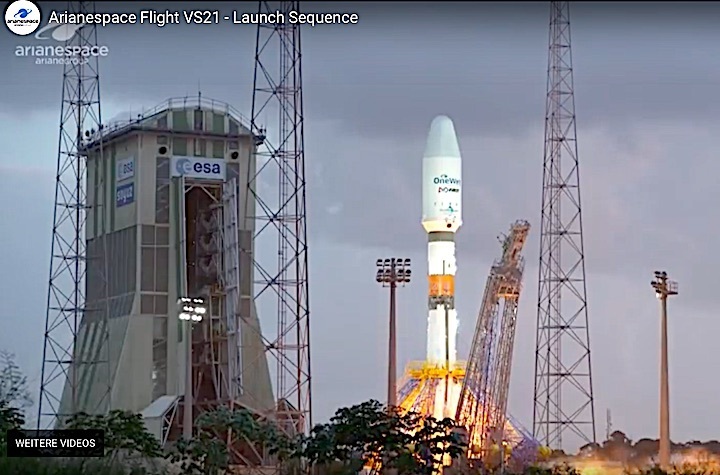 The upcoming Flight VS21 will mark the 21st liftoff of Soyuz from French Guiana since this medium-lift launcher’s 2011 operational debut at the Spaceport. 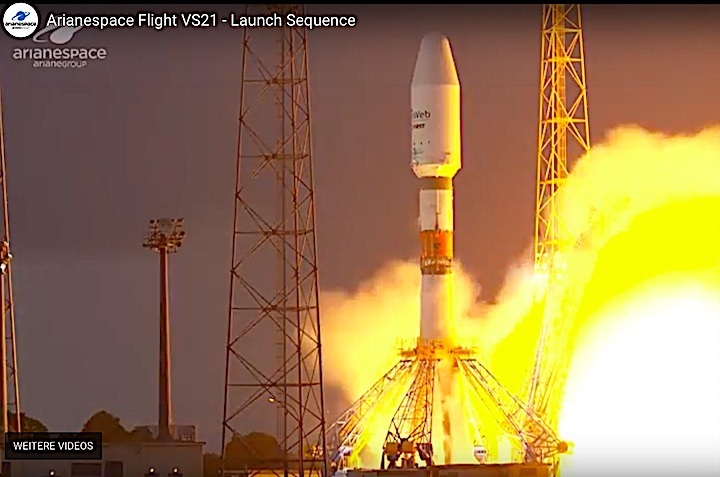 As Arianespace’s second of up to 12 missions planned for 2019, Flight VS21 also will continue the momentum gained from the company’s year-opening launch: Flight VA247 with Ariane 5, which successfully delivered a pair of telecommunications relay platforms – Saudi Geostationary Satellite 1/Hellas Sat 4 (HS-4/SGS-1) and GSAT-31 – to geostationary orbit on February 5. Based on the positive results of analyses performed with Russian space authorities responsible for a Soyuz launch performed from Baikonur Cosmodrome on February 21, 2019, Arianespace has taken the decision to resume preparations for its Flight VS21 OneWeb F6 mission at the Guiana Space Center. The launch vehicle, along with the satellites, will be transferred to the launch zone today, February 23, enabling the flight to take place on Wednesday, February 27, 2019. The launch readiness review will be held on Tuesday, February 26, 2019 to authorize the final countdown. Director General of Russia's state space corporation Roscosmos Dmitry Rogozin has congratulated OneWeb Executive Chairman Greg Wyler on successful delivery of six satellites to the orbit. "I congratulate Greg with a successful start of joint work! 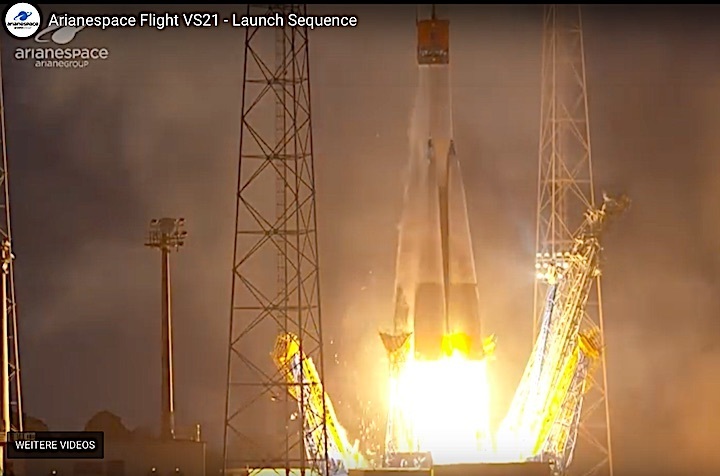 All six OneWeb apparatuses were delivered to their calculated orbits by the Soyuz rocket and the Fregat upper stage," Rogozin wrote on his official Twitter account on Thursday. 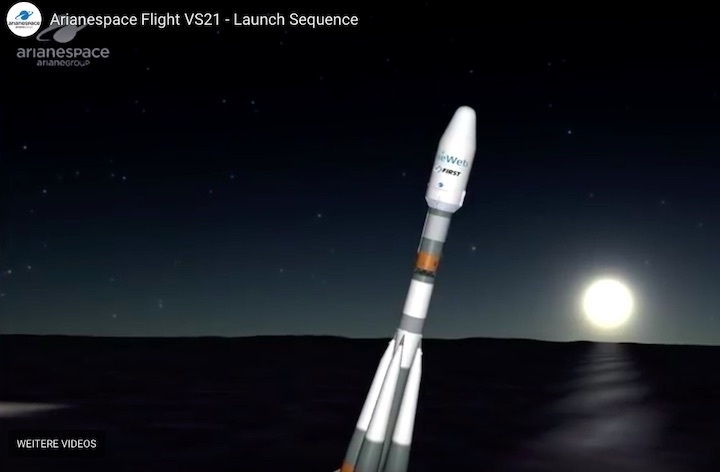 OneWeb satellites were launched in the routine mode. They will ensure broadband access to internet for users across the world. The Soyuz-ST rocket carrier was launched from the Kourou spaceport in French Guiana at 6:37pm local time (12:37am Moscow time). The first two apparatuses separated from the Fregat upper stage after 1 hour 4 minutes after the launch. The remaining four spacecraft were delivered to the orbit 19 minutes later. 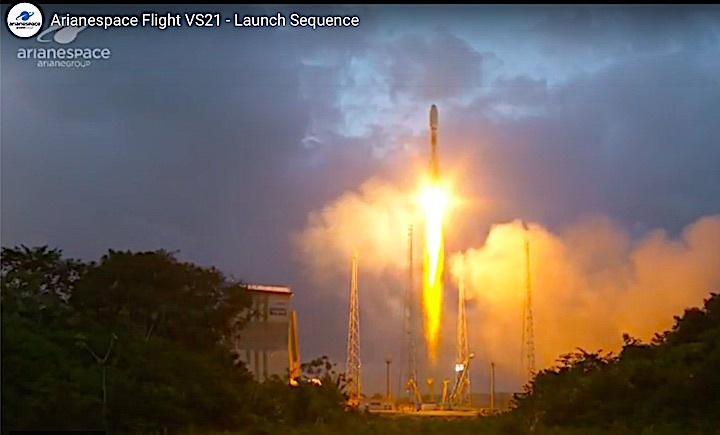 KOUROU, French Guiana — The first six satellites in a constellation that could one day number close to 2,000 were successfully launched Feb. 27 aboard a Soyuz rocket. 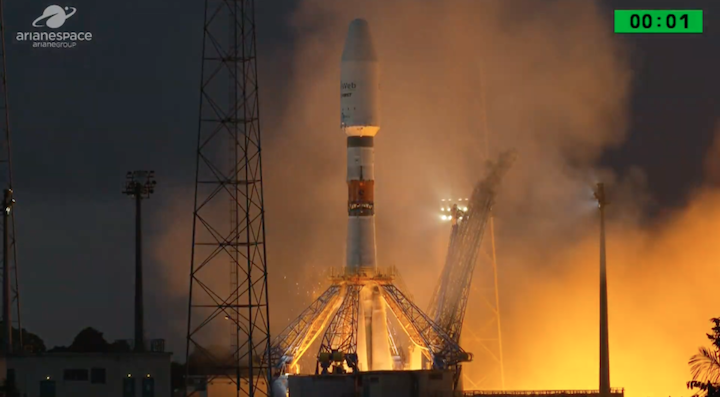 The Russian rocket, adapted for European launch provider Arianespace to operate in the tropical weather that defines the company’s spaceport in French Guiana, deployed the first two satellites 63 minutes after a 4:37 p.m. Eastern liftoff. 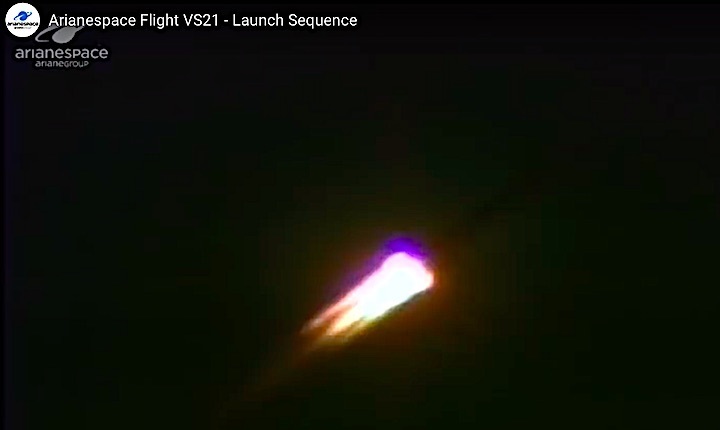 Arianespace confirmed separation of the last four 97 minutes after liftoff, about 15 minutes after the scheduled separation time due to a lack of ground stations in range of the rocket as it passed overhead. The launch marked the end of the beginning for OneWeb, a British company founded by American entrepreneur Greg Wyler in 2012 that seeks to make low-cost internet a global phenomenon via a constellation of mini-fridge-sized satellites each weighing roughly 150 kilograms. 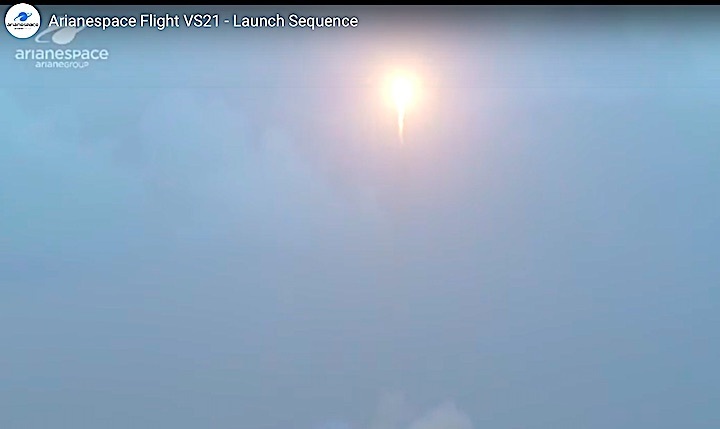 The six satellites launched to a 1,000-kilometer orbit, where they will begin a 60- to 90-day test regime that includes orbit raising for another 200 kilometers. OneWeb originally planned to launch the satellites directly into their 1,200-kilometer operational orbits, but tweaked those plans sometime before the launch for reasons that were not immediately clear. 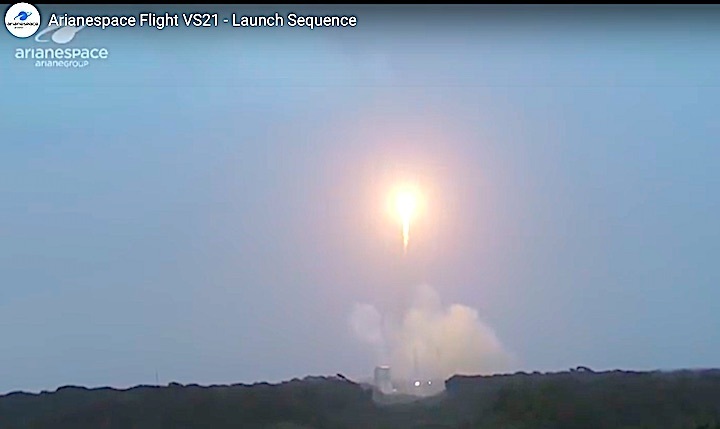 In the weeks preceding the launch, OneWeb also changed the number of satellites from 10 to six, opting to hold some back in the event of an anomaly. Four mass simulators from APCO Technologies of Switzerland substituted for the withdrawn spacecraft. 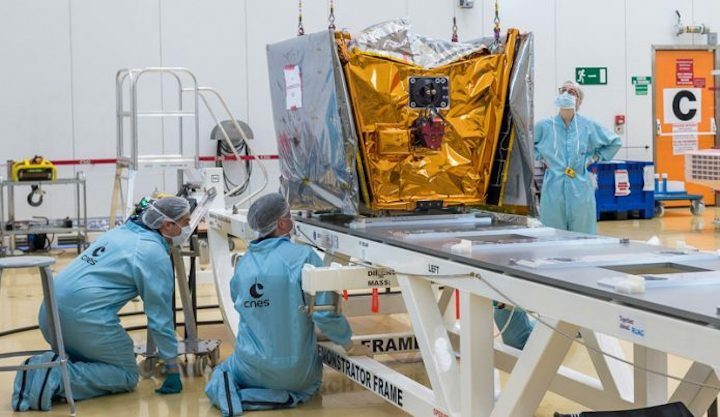 A review of that mission, which successfully orbited the Egypsat-A observation satellite for Egypt, delayed OneWeb’s launch by one day. None of the four anomalies happened during Arianespace-operated missions. OneWeb CEO Adrian Steckel, in remarks made this morning, described the company’s first launch as of near-vital importance. “We’ve achieved a lot, which means we got here, and if today doesn’t go right, it will almost be for nought because it is going to be very complicated to get us back on the right path,” he said. A major function of these six satellites is to “bring into use” OneWeb’s spectrum, meeting a deadline from the International Telecommunication Union to employ the spectrum or else lose rights to it. Wyler said the deadline is Nov. 29. OneWeb has already exhausted more than $2 billion on preparing its low-Earth-orbit constellation, Steckel said, having secured launches, built ground stations and established the infrastructure to build two satellites a day through a joint venture with Airbus Defence and Space. Today’s launch and the completion of in-orbit testing paves the way for the next 20 Soyuz launches, each carrying up to 36 spacecraft, Steckel said. Israël said the subsequent OneWeb launches will start in the second half of the year from Russia’s Baikonur Cosmodrome in Kazakhstan. The majority of the remaining Soyuz missions are expected to occur from Baikonur, though Europe’s Guiana Space Center in Kourou, French Guiana, and Russia’s new Vostochny Cosmodrome in the country’s Far East are also possibilities, Israël said. Virgin Orbit is also expected to start launching OneWeb satellites this year using its dedicated smallsat vehicle LauncherOne. 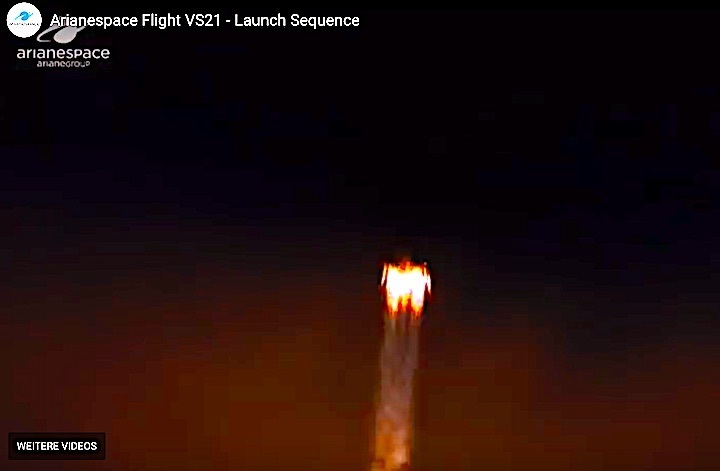 Wyler, responding to a SpaceNews inquiry, tweeted that the four satellites OneWeb withdrew from the Feb. 27 Soyuz mission could launch this year with Virgin Orbit, which has a contract for 39 missions using the LauncherOne air-launched rocket. Steckel said LauncherOne can carry one to two OneWeb satellites at a time, but will mainly be used for fleet replenishment rather than constellation deployment. Arianespace and OneWeb announced after the launch that OneWeb will also fly satellites on the inaugural flight of Ariane 6. The mission, scheduled for 2020, will use the Ariane 62, a version with two strap-on boosters. Israël tweeted that the OneWeb-Ariane 6 launch agreement includes options for two more Ariane 6 missions, and will be finalized next month. OneWeb anticipates having around 150 satellites in orbit by year’s end, starting regional service in 2020 with around 300 satellites, and reaching global coverage in 2021 with 600 satellites. Wyler said that with six satellites, OneWeb can provide service for 18 minutes at a time, with that number scaling as launches progress. Save for this first mission, OneWeb’s other satellites will separate from their launchers roughly 500 kilometers above the Earth and use onboard electric propulsion to reach their final 1,200-kilometer orbit — a journey Wyler estimated will take about four months. Steckel said the company is targeting 648 satellites initially, with 48 serving as in-orbit spares. Beyond that, OneWeb is deciding if it will scale its first-generation constellation to 900 satellites or shift into a second generation that would likely increase the total constellation to 1,980 satellites. Each first-generation OneWeb satellite costs $1 million to produce. 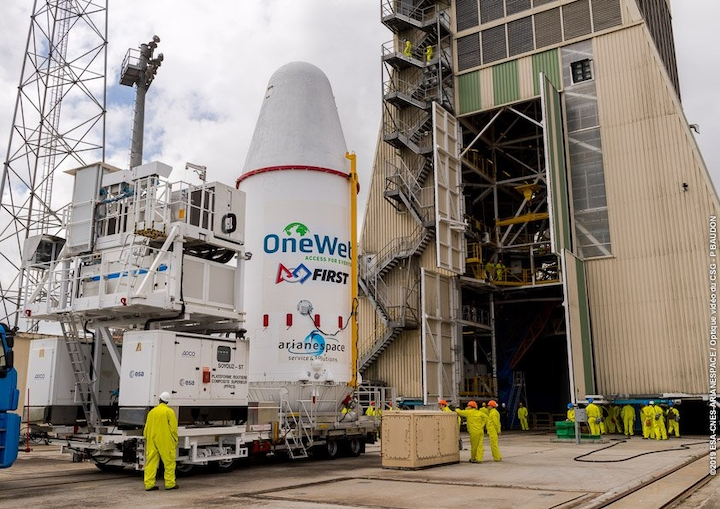 OneWeb Satellites, the joint venture of OneWeb and Airbus, built the first 10 satellites in Toulouse, France, but plan to build the remainder of the first-generation constellation at a new $85 million factory in Exploration Park, Florida. OneWeb announced its first customers Feb. 27: satellite teleport and network operator Talia and Italian telecommunications company Intermatica. OneWeb is targeting several markets for connectivity, including inflight Wi-Fi, maritime and government users, but also has a mission to bring internet access to every school in the world. Steckel said the company will start pursuing that goal by sponsoring connectivity for six schools — one each in Alaska, Rwanda, Nepal, Kyrgyzstan, Ecuador and Honduras — for 10 years. 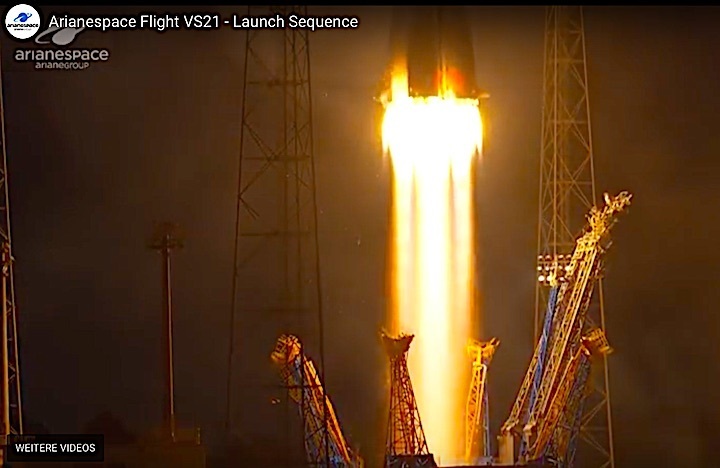 The Soyuz rocket carrying OneWeb’s first satellites also bore the logo of FIRST (For Inspiration and Recognition of Science and Technology), a nonprofit focused on instilling youth with a fascination for science and technology.